The interface redesign that Android P introduced recently is slowly seeping into the company's other products. 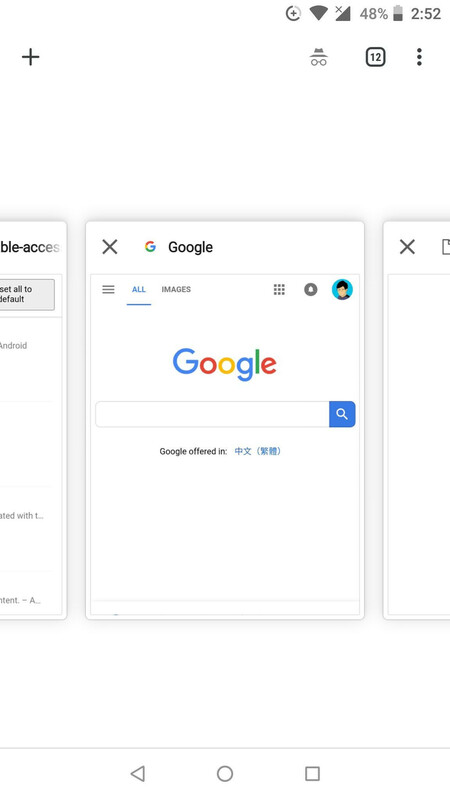 Recently, it has come to light that the Chrome browser itself could be scoring a horizontal tab switcher that seems very similar to the new app drawer in Android P, which would make for a cohesive experience throughout the interface. Currently, the features is only available in the unstable Chrome Canary version of the browser as an experimental flag, but supposedly, it would get introduced into the "flagship" version of the app. In the current tab app switcher, you get to see previews for 5 tabs. With the horizontal tab switcher, you get to see the preview of one tab only and a third of another one to the right. You lose some space, but you also gain a really nifty swipe-down gesture from the tab switcher button that allows you to more easily see your latest tabs. Win some, lose some. To give the new tab switcher a swirl, make sure you have the latest up-to-date version of Chrome Canary, first you'll need to get into the Chrome Flags interface by typing "chrome://flags" in the address bar, then search for horizontal in the search box below. You should enable the "#enable-horizontal-tab-switcher" entry and promptly relaunch your browser to see the effects take place. This is a terrible change. How am I supposed to browse through my 200 plus open tabs? Switching browser is this happens. 200+ tabs ? Seriously ? You need a life dude! google started messing with us..